Over the last few months I’ve gathered together some new items to share. On the gaming front I’ve been interested in Code of Princess for a number of years since it was released for the Nintendo 3DS. I was happy then to see it listed on the Steam storefront. Somewhat recently it went on sale and I picked it up there. When it comes to the Yakuza series I’ve bought all of them. However, I’ve only played up through the third game. To make sure I didn’t miss one I bought it at a higher price than I’d expect it to be by now. This means I have Yakuza 0 finally in my collection. I was afraid it would escape me when it was easier to get the later released Kiwami title. No worries now. Other items I picked up are three movies on Blu-ray. My favorite of the bunch is a 2016 film called Sing Street. I can’t remember why I decided to watch it in the first place, but the way it tells the basic coming of age story wouldn’t be anything special if it wasn’t set in the 1980s. Another thing that makes it fun is the soundtrack from the band the main character starts up and it takes after the European hits at the time. This is because it takes place in Dublin. While I’m not familiar with the area, the themes of growing up are still the same which makes it relatable. The other two are True Romance from 1993, which is not about what the title may suggest, and also V For Vendetta from 2005. The latter is very much applicable to the United States today. That’s it for the moment and as always thanks for reading! On episode 84 of the Hart & Usagi Podcast we chat about a variety of topics like Awesome Games Done Quick 2018, anticipated games of 2018, a lot of remastered games getting announced, and more. 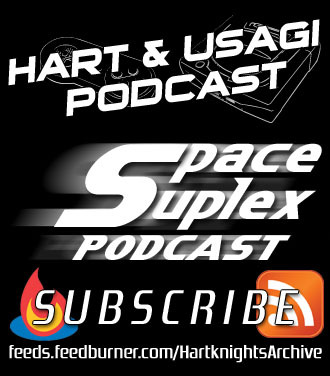 Episode 80 of the Hart & Usagi Podcast is here! We chat about a variety of topics like the Nintendo Switch, recently played Syphon Filter: Logan’s Shadow, E3 now being open to the public, and more.